If you want to get SERIOUS about steak then you are going to need the right grill. Your journey to find the best grill for steak is going to take you in some interesting directions since there are several ways of cooking the perfect steak. If you want to use a charcoal grill for your beef then your two best bets are a PK Grill or a Weber kettle. Both of these grills are amazing and will last for decades. Which one is better has been debated for years with strong loyalists on both side of the argument. GrillGrates are essential for getting perfect grill marks. GrillGrates eliminate flare ups which is critical for direct, high heat grilling. 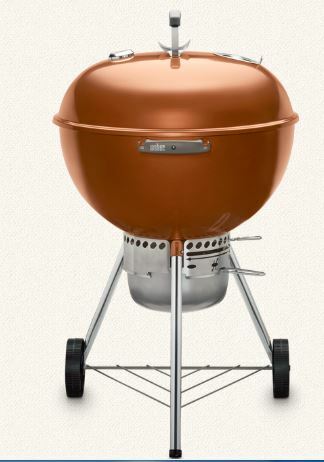 PK Grills are American classics made of rust proof cast aluminum and will last for decades. The thick cast aluminum is able to handle the consistent scorching temperatures for searing steaks. The rectangular cooking area lets you easily set this grill up two zones for searing high heat or a gentler zone for doing reverse sear cooks. 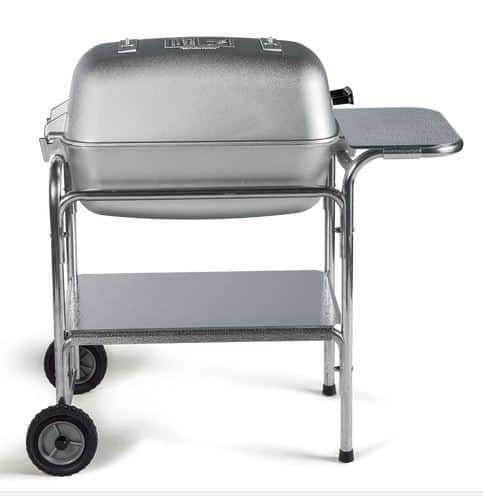 PK grills have four air vents (two inlets and two outlets) for precision air control. There is an organization, the Steak Cook Off Association, that holds competitions to see who can cook the best steak in the world. All that the SCA cares about is which steak is the best…they don’t care what you use to cook it. At an SCA cook off you are allowed to use ANY type of grill. You can use charcoal, gas, electric, pellet smokers, etc. These are competitions where thousands of dollars in prize money are on the line. It should tell you something that, given the amount of grill choices these competitors have, a PK grill was used to cook the winning steaks at the 2014, 2015 and 2016 World Championships. PK Grills have now partnered with the SCA and are the official grills of the association. I would call that a serious stamp of approval. Here is a video from the 2015 SCA World Champion showing you exactly how he grills championship quality ribeyes using a PK grill and a set of GrillGrates. Here is another video that PK put together. It features short snippet interviews with several other SCA champions on why they use PKs for steak competitions. The PK original grill works amazing but is a little small. The larger PK 360 grill is perfect. While these grills might look expensive please remember that they are so well built that they will last a lifetime. The Weber kettle is the best selling grill of all time because it is simply a great product. The grills are made of porcelain enameled steel that comes with a ten year warranty. While PK Grills are the official grill of the Steak Cookoff Association plenty of folks still compete, and win, with Weber kettles. Here is a video from another SCA champion, Malcolm Reed, showing you how he cooks ribeyes on a Weber kettle using GrillGrates. Just for kicks, here is Malcolm’s video for his competition steaks using a PK grill and GrillGrates. I think one of the reasons that PK Grills are more popular than Weber kettles at steak competitions is that PK grills are easier to transport. This is especially true if you are working with the cart mounted Weber Performer Deluxe. If you want to buy a Weber kettle then either the 22 or 26 inch version is what you want. The 18 incher is really too small and the monster 36 inch Ranch is ridiculously over priced. The direct, high heat, steak cooking techniques featured in the videos so far are just one way of grilling incredible steaks. Let’s stick with Weber kettles and explore some more options. One of the fun things about owning a Weber kettle are all of the accessories that companies make for them. One of the cool steak accessories is called the Slow n Sear. The Slow n Sear can be set up for serious Low and Slow barbecue or intense high heat searing. Here is a video showing you how to use the Slow n Sear in a Weber kettle using the Cold Grate technique to grill the perfect steak. A classic way of grilling tri tip steaks is with a Santa Maria style grill using wood or charcoal for fuel. The Santa Maria style of grilling is defined (by me at least) by the combination of open air grilling and the ability to change the distance between the meat and the fire. There is a company that makes a Santa Maria attachment for Weber kettles that looks awesome. Here is a video showing it in action. If you like the Santa Maria approach then you should also check out the slightly different Argentinian style attachment that is available on Amazon. The biggest limitation of most gas grills is that they can’t get as hot as needed to properly sear a steak. If you want to get a sear on your steak using a gas grill then you are going to need a grill with an infrared burner. An infrared burner can reach temperatures in the 800-900F range and are the perfect way to finish a reverse sear. Here is a post that covers the best infrared grills in detail but I will give you the short version below. Char Broil makes affordable infrared gas grills that work pretty well but will rust out in three to five years. The grills are only partial infrared with about 65% of the heat being infrared and the balance being convection. There are companies like Solaire and TEC that make high quality 100% infrared grills. The grills are amazing, well built and expensive. The 100% infrared grills are spectacular at high heat searing but are not particularly suited for low heat usage. Another approach is taken by companies like Napoleon which have traditional convection burners inside the grill but has an infrared ceramic burner as a side burner. I think the dual burner approach is the best compromise between getting the full functionality you want from a backyard grill while still getting a serious searing machine. 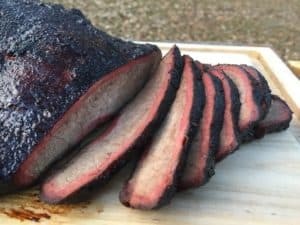 I really enjoy the smokey flavor a steak gets when cooked on a charcoal grill but also understand the convenience and simplicity of cooking on a gas grill. The best compromise between the charcoal and gas worlds is the Woodwind Pellet grill from Camp Chef. The Woodwind is a pellet grill with a digital controller which makes it just about as easy to use as a gas grill. The pellets are made of compressed sawdust that give a slight smokey flavor to your food when they burn. 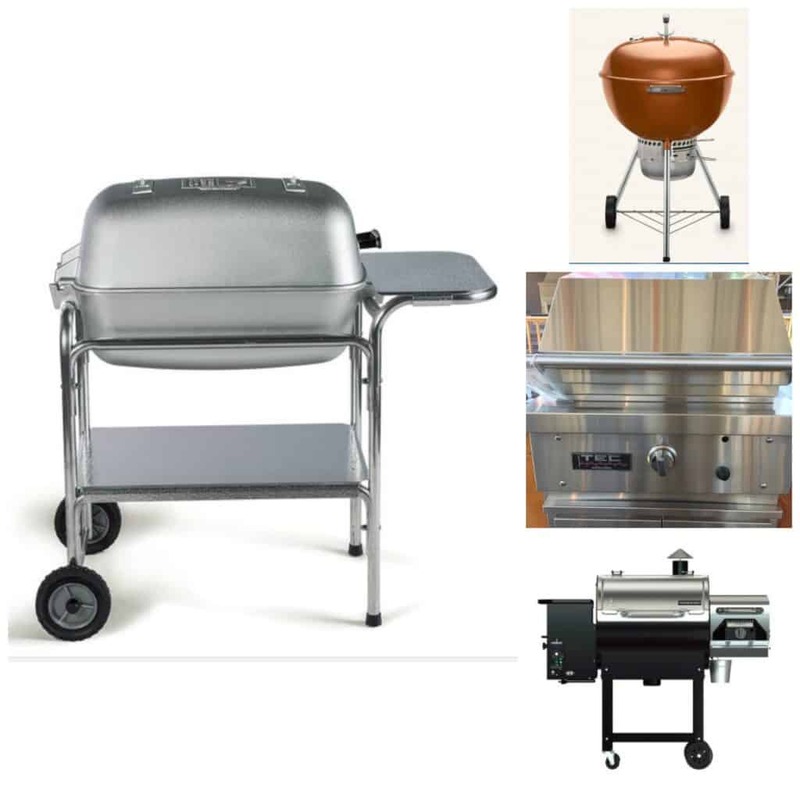 Most pellet grills have an upper temperature range of about 450F so they, like gas grills, lack real searing power. 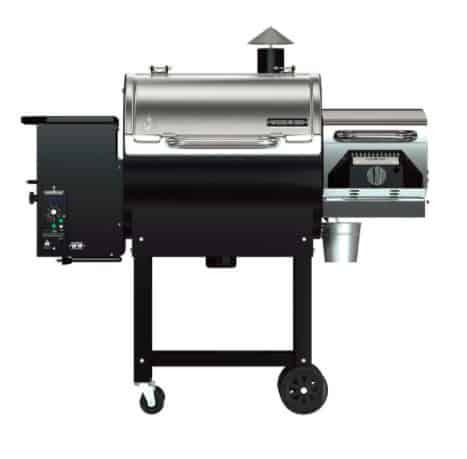 The Woodwind from Camp Chef is different because it has a side mounted, propane fueled, ceramic infrared sear burner. 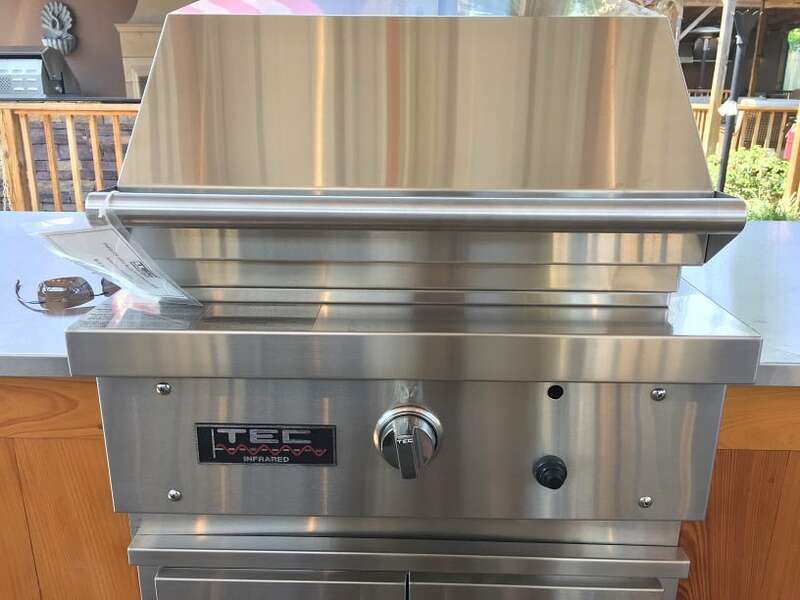 This grill is perfect for gently smoking steaks and then finishing them off with a high heat sear on the high heat side burner. Camp Chef makes excellent products and consistently make my list of the Best Pellet Grills for the Money. Here is a look at the Woodwind being used to do a reverse sear on a thick tomahawk ribeye.